Built from the Underframe of Pantograph 168 in 1961, the Rocket was built at a time where the America and the USSR were involved in the 'Space Race' and it was generating world wide interest. The Rocket made its debut on illuminations tours in September 1961. The design of the Rocket was and still is unique both with its shape and the fact that the passengers sat at a 30 degree angle. In the 'cockpit' of the Rocket were 2 redundant waxwork models from Tussauds waxworks dressed as Astronauts. The driving cab was located underneath the end of the Rocket. Unusually when first built, the Rocket was only fitted with one controller, which limited the tram to journeys between Starr Gate / Pleasure Beach and Little Bispham / Fleetwood. This also made shunt moves around the depot more difficult. A remote controller and air brake was fitted in 1967 and the Rocket became 732 in 1968.
was withdrawn in need of a rewire. It was donated to the Lancastrian Transport Trust on 2002 and it had a farewell tour on 28th April when it was enroute to Fleetwood, when it suffered a damaged lifeguard and had to be driven back to depot from the rear controller. It languished at the back of Rigby Road depot until 2012, when it was taken to the illuminations department, tidied up, rewired and displayed on the centre of Gynn Square roundabout. Here it would stay until early in 2015 when it was returned to Rigby Road depot to await a future restoration. The idea for the Western Train, came from then Transport Manager Joseph Franklin's wife, when watching a Western Film. Built in 1962, from Railcoach 209 (Locomotive) and Pantograph 174 (coach), the Western Train has delighted holidaymakers for over 50 years. Original features included smoke coming out of the funnel and real logs on the roof of the tender section. The Western Train was used to transport guests to the official opening of the ABC Cinema in Church Street in 1963, and subsequently were the last trams to operate in the Town Centre as the Marton Route had closed during the previous year and the track was kept especially for the opening. Just like the Rocket, the Western Train was fitted with a Remote Controller and air brake at the rear of the coach in 1967. 1968 saw the Locomotive numbered 733 and the coach numbered 734. 733+734 were both rewired during the 1980's. In 1999, 733+734 were withdrawn in need of a rewire, whilst 733's underframe had started to droop, giving the locomotive a banana type look. Other thana further outing when both halves of the train were towed to Fleetwood for the 2003 Tram Sunday, they would languish at the back of the sheds until 2007, when it was announced that Heritage Lottery fund, were funding a restoration of the train. The trailer's underframe and bodywork was found to be in excellent condition and a rewire and restoration of the interior to Pantograph car condition were carried out. The locomotive required more work. A new underframe was built, and the frame from one of the passenger saloons from Twin Car motor 677 was grafted on the new underframe for use as the tender, whilst the remaining framework from the loco also transferred onto the new frame. Following the rewire, repanel, fitting of new lighting and a wheel chair lift to the loco, 733+734 were returned to service in 2009, regaining their rightful place on the illuminations tours. 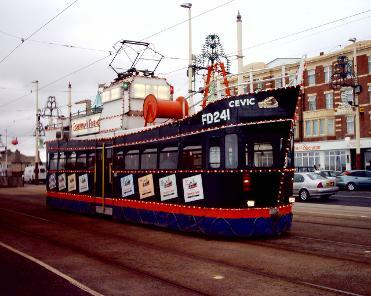 Built in 1963 from the frame of Railcoach 222, the Hovertram would become Blackpool's first and to date only double decked illuminated feature car. The Hovertram was the highest capacity car in the Blackpool fleet, able to carry in excess of 100 people. The tram had a single entrance at the rear, with a remote control and airbrake to allow for shunting and reversing back to depot. Inside the lower deck had a central aisle with the ceiling lower on the right hand side as this was the walkway for the upper deck. On the upper deck was the aisle running down the right hand side of the tram, whilst passengers were seated on rows long enough for 4 people to sit on. At the back next to the staircase was a large box containing the controls that worked the lighting sequences for the lights on the exterior of the tram. The Frigate (also known as HMS Blackpool) was built in 1965 from the underframe of Pantograph car 170. The existing underframe was extended and a new wood framed body was constructed with full cab at the bow end and remote shunt controller at the rear. A single, entrance was built on the rear of the tram with illuminations on the exterior. The Frigate entered service during the 1965 Illuminations. In 1968 it was numbered 736. It's illuminations were modernised in 1979. By 2001, 736 was beginning to look tired and was in need of an overhaul and rewiring. The tram was withdrawn at the end of the 2001 illuminations. Following the withdrawal of 736 (and 735) in 2001 and the earlier withdrawal of the Rocket, and Western Train in 1999, there was only the recently built Trawler (633) available as an illuminated feature car. As a result of this, In 2003 736 was selected for a major overhaul. The original body was scrapped, with the exception of the bow and the underframe received some major repairs to straighten out and strengthen it. A new body and roof was built to a new style which looked more like a Frigate than the original. A full set of controls were provided at both ends, however a door was only installed at the rear of the tram on the left hand side, limiting the tram to only carrying passengers with the bow leading. 736 re-entered service in its new form in September 2004. It has run on illuminations tours, specials and heritage service on a regular basis. In May 2009, prior to the tramway upgrade, 736 found its self running on the Fleetwood - Starr Gate service due to a shortage of servicable single deck trams. In 1998, Brush Car 633 was withdrawn in need of a major overhaul. It was stripped to a shell and stored. As Both the Rocket and Western Train were being withdrawn, a design for a new illuminated car was produced. 633 was chosen as a base for the new tram and was rebuilt during 2001 and re-entered service in time for the 2001 illuminations. 633 required a new underframe, this was built and 633's frame was transferred on to it. The old roof frame was removed to allow a new flat roof to be fitted. 633 retained its centre doors, while a mock funnel, wheel and railings were fitted to the roof. 633 retained full cabs at both ends and was regularly used on the main Fleetwood - Starr Gate service prior to the tramway upgrade. One drawback was that all seats face the same way meaning sometimes everyone would be facing backwards. and repaint in Winter 2014 and should return to service in 2016 with new illuminations and the interior seating will receive the more traditional style of moquette.